Nikya of the Old Ways is an interesting brew-around. A 5/5 for 5 CMC, she has a solid body. She also has two interesting abilities — one that is a hindrance and the other which is a boon. Cards like Zendikar Resurgent have been around for a long time and mana doubling isn’t something new, but having this ability stapled onto our commander is a great way to exploit it. The downside is her other line of text, which reads “You can’t cast noncreature spells.” This is why I’ve called the deck “We don’t need no stinkin’ spells” because I’ve built around this hindrance to the best of my ability. What this means is that we need to find ways to do things with our creatures that we would normally do with spells. However, this doesn’t mean that we can’t include a small amount of spells, artifacts and enchantments, because there will be times when our commander isn’t out yet, or perhaps gets killed off enough times that we can’t afford the commander tax. Since our creatures are going to be doing multiple things, let’s break them up into categories to wrap our heads around this. Since we’re running a creature heavy deck, we’ll want to be able to tutor out answers for particular problems. Fauna Shaman, Fierce Empath and Brutalizer Exarch will all do so, but each has its own prerequisites to do so. I’ve also included some creatures that will ramp us a bit by tutoring out lands. They have to be basics unfortunately, but extra ramp will always do us some good, particularly when we have a commander that doubles up our mana (and that Hydra will be bigger the more land we have on the battlefield!). These creatures should help us with card draw, since we don’t have a bunch of options otherwise. Beast Whisperer will draw us a card everytime we cast a creature, so that’s great replacement value. The Heartwood Storyteller will get us cards whenever anyone casts noncreature spells, but our other two opponents will benefit from this too. We’re hoping that our additional mana sources will help to offset this fact. Tireless Tracker gets us clues on land fall, and clues get us more card draw. Finally, Magus of the Wheel is Wheel of Fortune on legs, and will let us dump our hands (also potentially screwing up our opponents too). Genesis Hydra and Silhana Wayfinder have ETB’s where we can look at cards from our library and then put creatures/lands onto the battlefield so that’s some nice selection. Vizier of the Menagerie is also a nice way to cast creatures off the top of your library without having to worry about having the specific mana colors needed. I’ve added three mana dorks that aren’t the norm (usually it’s Elvish Mystic and Birds of Paradise). Zhur-Taa Druid feels better he does some damage along the way, and the Somberwald Sage adds three mana to cast creatures which we want. The Shaman of Forgotten Ways is also a mana dork, but I really worked him into the deck for his other ability — he’s basically Biorhythm on legs. That’s a banned EDH card (and one that I own) that lowers life totals to the amount of creatures each player controls, so we should be able to do this with enough creatures out to end the game, hopefully. Otherwise we have cards like Mina and Denn and Azusa that allow us to play extra lands on our turns. Regal Behemoth is also a mana doubler as long as we are the Monarch, and monarchy itself provides some extra card draw, so bonus. Radha gives us some mana for attacking, which should happen a bunch in this deck, and the Courser allows us to play lands off the top of our library. All around good stuff that should ensure we are always ahead in the land and mana departments. Pretty straight-forward here, we have some creatures that will kill artifacts, enchantments, lands or just permanents in general. Molder Slug is particularly evil, forcing players to sac artifacts every turn — this does affect you too, but you don’t have many in the deck so it shouldn’t matter. This is pretty much a catch-all catergory for the rest of the creatures in the deck. First off we have a couple more Hydras that are great mana sinks for all that extra mana we should be producing. Another Hydra here will capitalize off of the spells everyone will be casting. I’ve included the three Incarnations that we can slot into this deck, Anger, Brawn and Genesis. The first two will give our creatures Haste and Trample respectively as long as they are in our graveyards, the latter will allow us to recur creatures every turn as long as it’s in the yard. The Cat Snake can’t be countered and makes our creature spells uncounterable (so everyone will have to use other forms of removal). 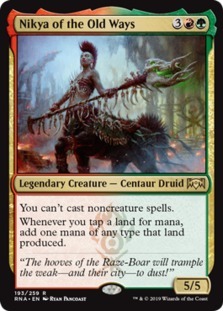 Temur Sabertooth is in the deck so that in those cases when we need to get rid of our commander in order to cast noncreature spells, we can bounce her to our hand and avoid commander tax. Seedborn Muse is just value, so is Ruric Thar because he penalizes noncreature spell casts by pinging for 6 damage for each cast. Lastly, Avenger of Zendikar, Pathbreaker Ibex and End-Raze Forerunners are potential game winners and are some of the most expensive creatures in the deck. As you can see, there’s not a bunch here. When it comes to artifacts, we’re only running Sol Ring and three Gruul rocks. Enchantments are limited to a couple of cards that give haste (or riot which is basically the same thing), Abundance which is more card selection, Zendikar Resurgent for more mana doubling, and a “screw the blue players” card in Monsoon. For spells it’s a mix of more selection, removal, ramp and card draw. Pretty standard stuff and it all fits in line with what we’re trying to do. I’m not sure how competitive this deck might be but it looks like fun. You can check the full decklist here. I’ve always enjoyed making decks around brand new commanders. What do you think?